I loathe how vegetables don’t get to be in the limelight as much as meat or seafood. I was vegetarian when I was a child. My mom would tell me stories about how I would throw up even after eating some chicken broth. Over the years I’ve had to learn to eat more meat and seafood to essentially fit in. A few times as a teenager my friends would laugh at me when I was given a vegetarian meal on a school trip. 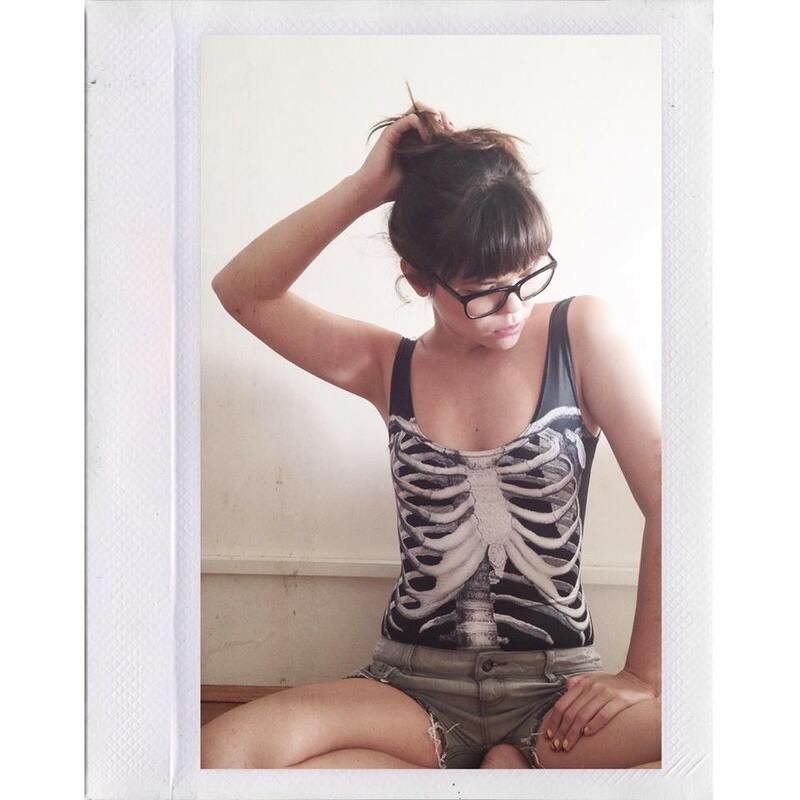 I also began eating more meat and seafood when I started writing and blogging about food. I felt like I needed to expand my food knowledge and experiences. I still don’t love meat except for three things: salami, currywurst, and chicken liver parfait. For me it’s mostly a texture issue that I have, but very often it’s also flavor. So, this means that I order some sort of vegetable dish when I’m eating out at most restaurants. Obviously, I order some kind of carbs as well, but I also love fresh, tasty veggie dishes. So when a friend of mine suggested that I should list all the best vegetable dishes I’ve come across, I got kind of excited. I’ve narrowed this list down to the best veggies I’ve eaten this year and hopefully I can keep this up as an annual post. Also, just a quick note that I don’t know if they’re all completely vegetarian (I’m not sure if fish sauce or oyster sauce has snuck in there somewhere). Anyway, here goes my list of top 15 veggies. The eggplant at Chinese Noodle House isn’t even the veggie of the year, it’s the veggie of all time. 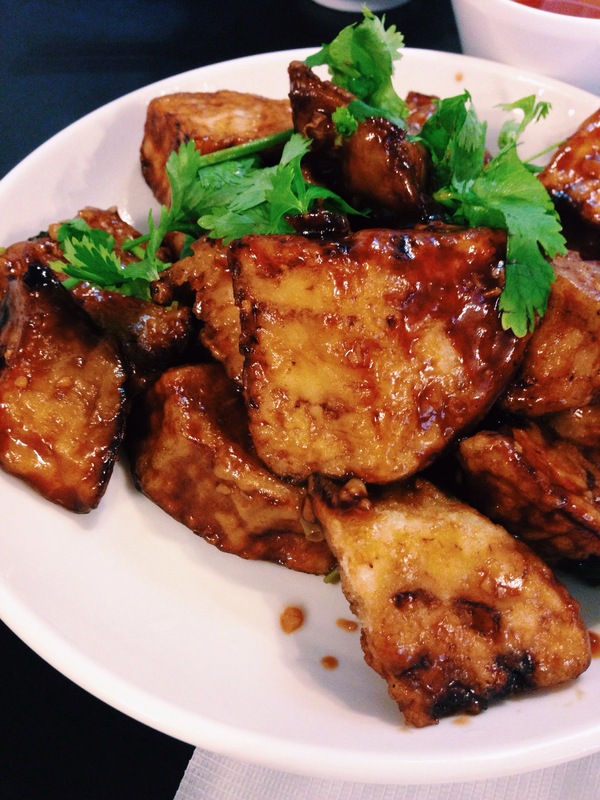 The deep fried eggplant is tossed in a garlicky, savory, and sweet sauce. It tastes so good, guys. I don’t even like eggplant that much normally. Note that it’s a bit inconsistent, but I don’t even care – it’s always worth at least a dozen visits a year. More on Chinese Noodle House here. In the fine dining world, my favorite veggie dish hands down are the carrots at Bennelong (I’ve ordered it both in the restaurant and at the Cured & Cultured bar). The salad of roasted organic carrots, sherry caramel, almonds, and sheep’s milk feta is perfection. It’s the most beautiful juxtaposition of sweet vs salty and soft vs crunchy. It goes without saying that the presentation is impeccable, too. One of the most complete veggie dishes you’ll ever come across is Indonesian gado gado. Satiating and insanely flavorsome, the dish is a salad of mostly cooked vegetables and tofu with an amazing peanut sauce. The gado gado at Willis Canteen is the best in Sydney made with a peanut sauce that’s created from scratch. More on Willis here. 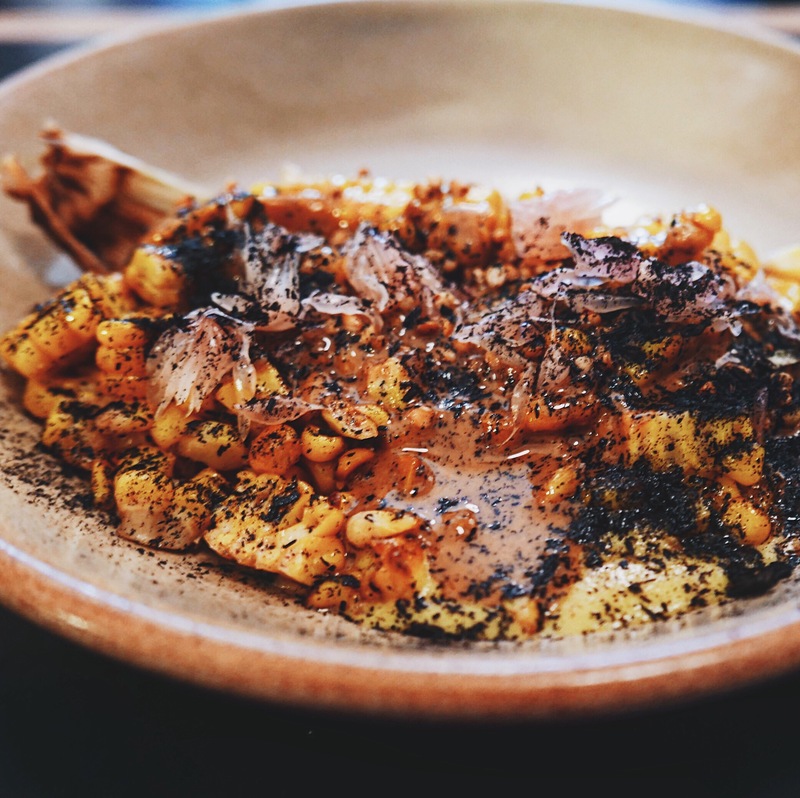 A late addition to my fave veg dishes this year, the corn with macadamia and wattleseed at Ester smacked us with intense flavors and umami deliciousness that’s reminiscent of miso corn. This one’s a keeper. I’ve been seeing (and eating) cauliflower in loads of restaurants this year – it might be the next avocado. Probably not. But the best cauli I’ve come across is without a doubt at Ester. Served with almond sauce and mint, plus chopped almonds, the roasted cauliflower gets my vote. I’ve also just realized there’s a recipe on Gourmet Traveller here. WIN. I guess I could go into semantics about how mushrooms aren’t really a vegetable, but they definitely still slot into the healthy, vegetarian-friendly space. So I’m going to give mushrooms a spot (or two) on this list anyway. 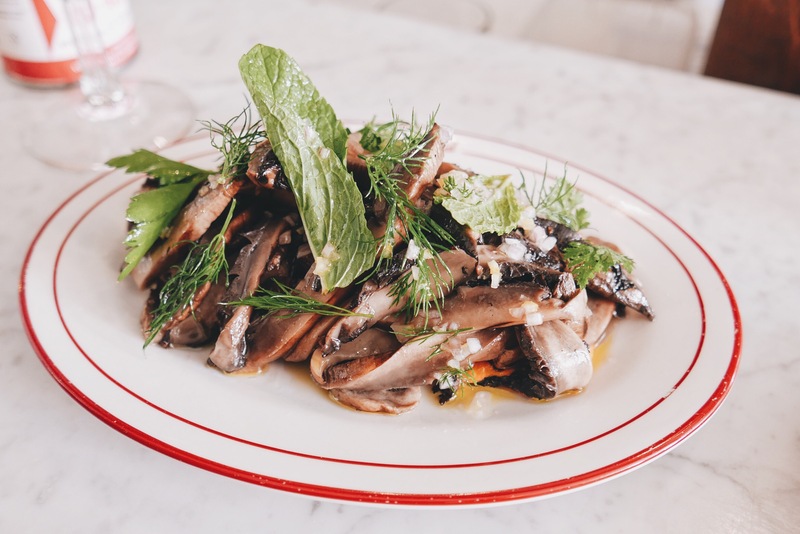 The grilled mushrooms with piquillo pepper, garlic & macadamia sauce, and herb salad were a stand-out at Continental Deli. There’s a pickled kind of flavor going on plus a nutty, creamy bonus from the macadamia sauce. More on Continental Deli here. Anything with miso always pops up on my radar as a must-order dish. 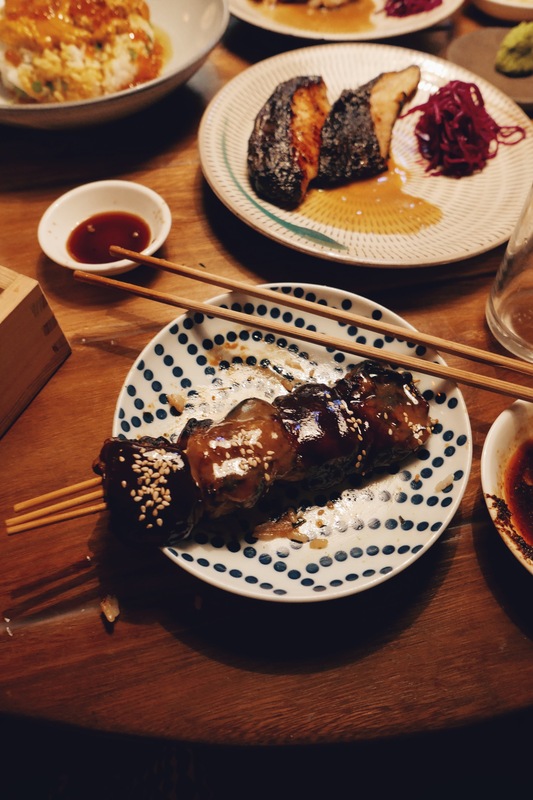 The eggplant skewer at Chaco is smothered in two kinds of miso, maximizing the play on sweet and salty flavors. More on Chaco here. These curls of crispy corn at Izakaya Fujiyama are kinda difficult to eat, but prevail – it’s worth it for the crunch and the shichimi pepper. Simple, but done well. 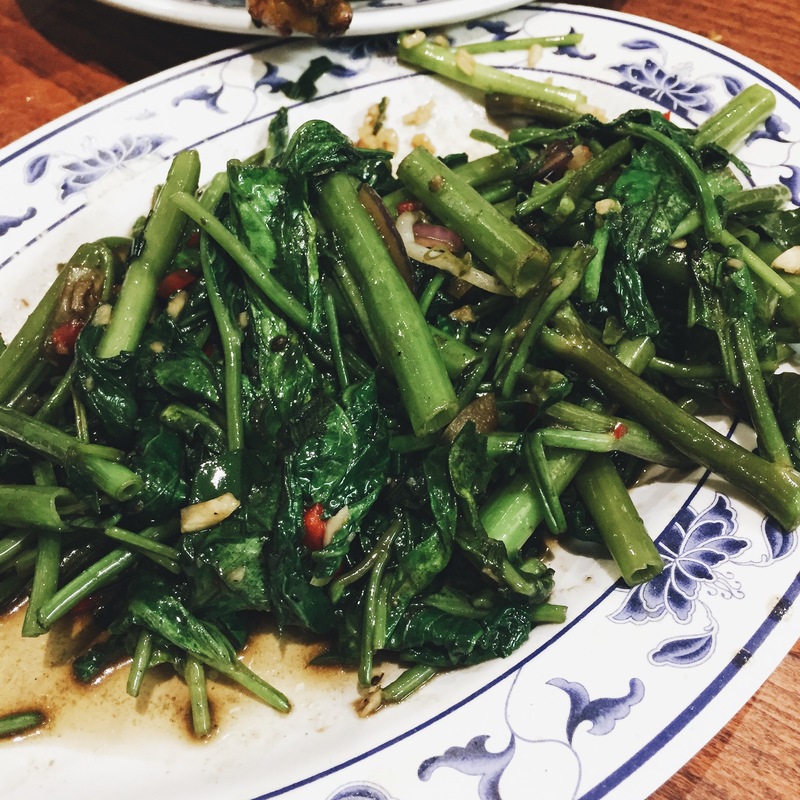 A must-order at Ayam Goreng 99 is the cah kangkung, a delicious dish of stir fried onchoy/water spinach/morning glory with chilli and garlic (PS. Why does this damn vegetable have so many names?). I’m pretty sure it’s made with belacan – shrimp paste – though. Check out my list of best Indo restaurants here. If you love vegetables, Yellow is must-visit. The highlight for me was the kohlrabi with enoki mushroom in a vegetable broth. And of course, the mushrooms add that super savory flavor that I love. More on Yellow here. We’re back to mushrooms! I find vegetarian dumplings can often be quite bland, but the wild mushroom dumplings at Mr Wong are really tasty. More on Mr Wong here. 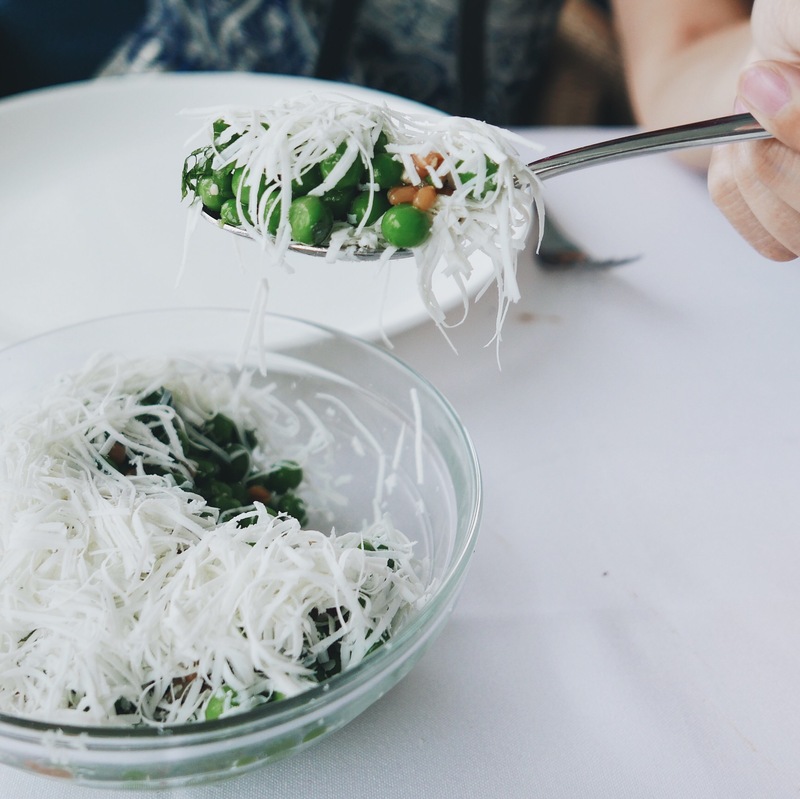 When we went to Icebergs recently, I was stoked to see that the peas are still on the menu – I tried them a couple of years ago. Loved them then, still love them now. They’re infused with so much flavor. Miniscule cubes of onion and celery are in the mix, then topped with a blanket of grated salted ricotta. More on Icebergs here. 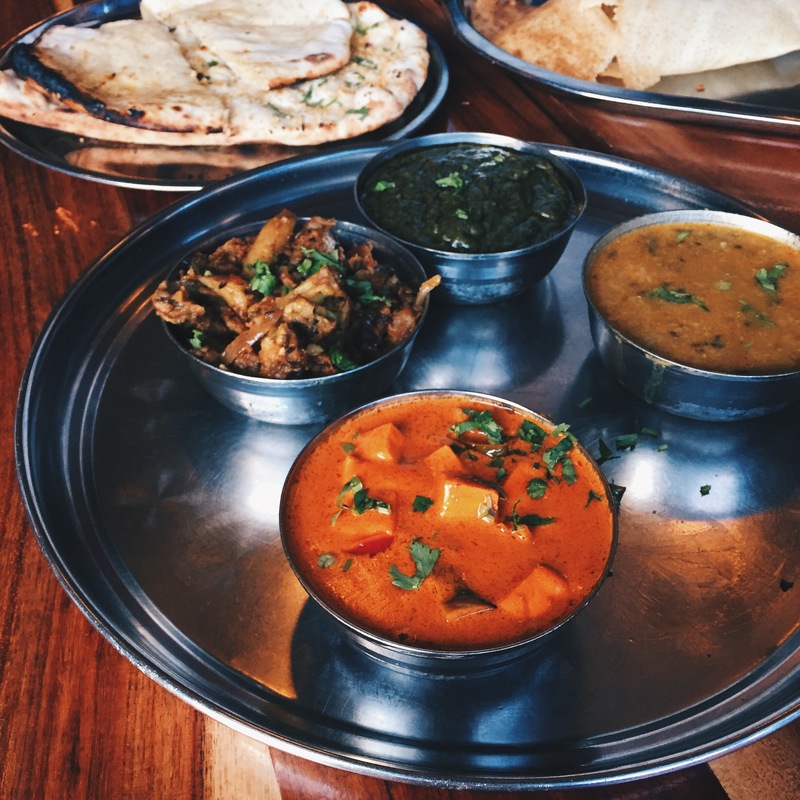 The curries at Maya Vegetarian change daily, but they’re always delicious! The photo below features some fantastic cauliflower, spinach, and daal. Maya also gets a gold star for their very reasonable prices. You might debate that ravioli isn’t really heroing a vegetable since it’s mostly pasta, but it contains pumpkin! And it’s so dang delicious. The thin pasta parcels are filled with sweet pumpkin then tossed in a fantastic burnt butter sauce and topped with yogurt. All the good things. More on Mercado here. 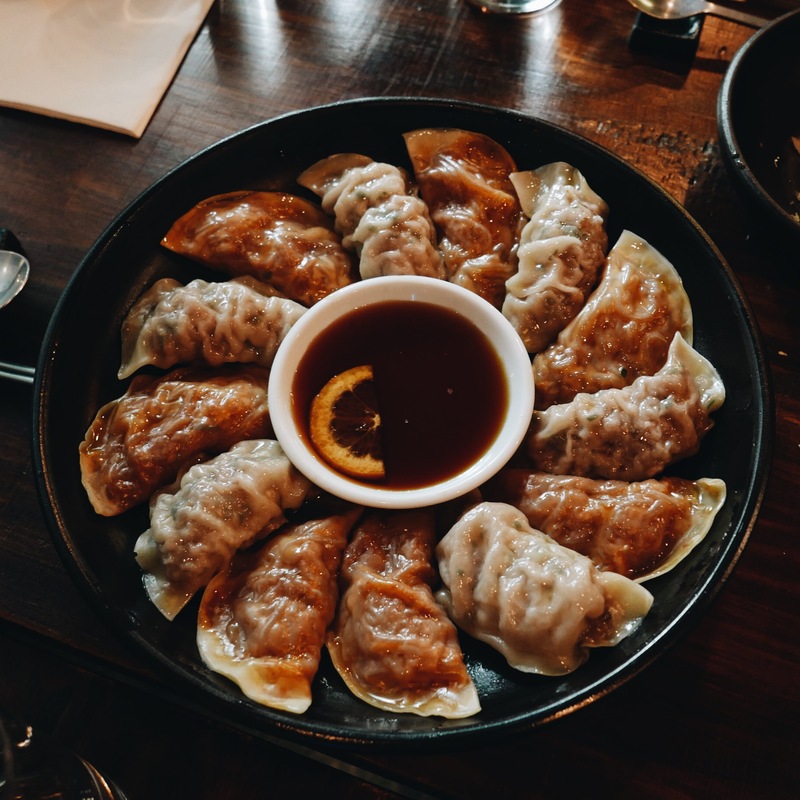 Sadly, Kim Restaurant closed earlier this year, but the kimchi mandoo were fantastic so I wanted to include them anyway. Half moon shaped and slightly translucent, they were a no-brainer for anyone who likes the funky fermented flavor of kimchi. Thanks Sarah. Love this! and as always with all your blogs. Nice! I didn’t know your dad is vegetarian! Yes! That eggplant dish at Chinese Noodle House is incredible. Forever incredible! Although also very inconsistent hahaha. Sometimes crunchy, sometimes saucy. But always delicious. I thought about that too actually!! But I already had a couple of mushroom dishes on here haha. Too many delicious mushroom dishes. I like carbs and stuff. Get notified about awesome new posts.